Last Friday we pointed the convertible in the direction of Greenport, NY to visit Go Shuck Yourself, the do-it-yourself oyster bar run by Ian Wile and his wife Rosalie. They are the force behind Little Creek Oyster farm that, as Ian says, produces “Sustainable Oysters. Grown with Pride in Peconic Bay.” Oysters come right from the hands of the oyster man, to a plate near you. Find Go Shuck Yourself in Texaco Alley. Ask anyone in town. Marian and I love oysters. We have eaten our way through Sherwood House’s outdoor oyster bar, and the Taste of the North Fork’s oyster slurp, but this time things would be different. We would be shucking those oysters ourselves. After years of watching raw bar masters opening oysters quickly, I surmised that it must be all about technique. Once you know what you are doing, it probably is. Until you know, it is an amalgam of strength, tenacity, and a sharp oyster knife that does the trick. No worries, Rosalie and/or Ian give you an oyster opening lesson as part of the experience. We brought our own instruments of torture, but it wasn’t necessary. 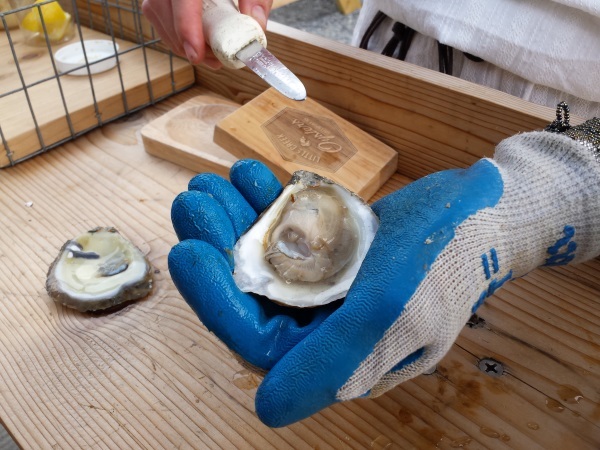 Go Shuck Yourself provides a variety of oyster knives, protective Kevlar gloves, and an oyster jack to hold the recalcitrant bivalve while you are convincing it to open. In the photo, it is Rosalie, oyster knife in one hand, the other protectively gloved, who has just opened an oyster. You can see the oyster jack just below the knife blade. It is shaped to hold the oyster and keep it from slipping. A simple yet clever device, we took one home. It turns out that different styles of oyster knives require different techniques to “pop the hinge”. I came to love the one with the curved blade. You may have a different experience. As an “apprentice shucker” you will not be opening the oysters in a big hurry, and that is a good thing. Handed a plate of a dozen shucked oysters, we will demolish the contents in a flash. This is more of a Zen experience, contemplating where to place the blade tip, how much to rock it, and how much pressure to apply, and other physics questions, before the oyster meets its fate. 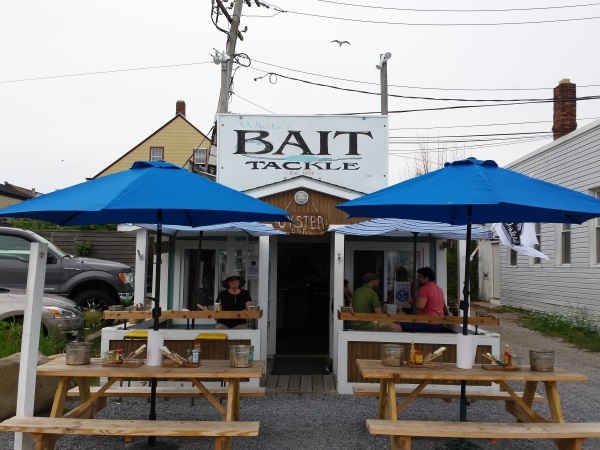 The oyster bar and picnic tables are comfortable, the mood is relaxed, and you have a water view, so why rush. One dozen can easily turn into two, as the stress of your week is transferred to your oyster. Knife in hand, you could imagine yourself levering open the boss’s head. Hey, whatever it takes to relax, the oysters don’t care. Heading back home on the ferry, Marian confided that she had fully expected me to have speared myself with the oyster knife as I inveigled the oysters to open. “No way”, I said. The fates had something else in mind for me. The very next day, I sliced the tip off of my thumb while prepping some veggies for a salad. Eight stitches later, I thanked the oyster gods for having spared me, but had other words for the mandolin god. Another few days and the stitches come out… good as new. Probably more oysters, and who knows what else. Our friend Kenny’s birthday is coming around again, so it will be time for another excellent adventure. Stay tuned, and enjoy your trip around town.